Welcome to InKing Royalty's February Blog Hop! This year's Blog Hop themes are inspired by a single word - and this month our projects are centered around BIRTHDAY. It's always special to celebrate the birthday of someone you love, so handmade birthday cards are always fun to share. We are excited to share our creations with you today! After you read my post, I hope you'll hop over to the next person on the list at the base of this post. When I first look at a new catalog I am not always the best at choosing the stamp sets that will become favorites but I fell in love with the Hand Delivered host set from the very beginning. It can be purchased with the Stampin Rewards you can receive from a $150 purchase. 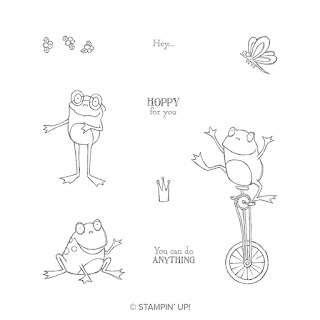 Not only is it very fun and cute, in my opinion, it is one of the most versatile stamp sets ever offered by Stampin up!. In addition to birthday there are five other occasions provided in the images and sentiments! Of course today I am using it for a birthday card today. Here is my card. The attendees of my monthly card class like to make birthday cards to send to friends and family and we had not made one in a couple of months so I wanted to use this set for a birthday card. I love the sign she is holding but the birthday sentiment in the set is not designed to fit on the sign. It is designed to fit on a banner somewhere else on the card so I pulled a birthday sentiment from an old retired stamp set. After I did that I realized that the sign was a perfect place to simply hand write any sentiment for any occasion that one desires! After all isn't the sign logically assumed to have been written by the sign holder? What a great opportunity to have any form of custom sentiment! Think about all the possibilities - they are truly limitless. For my card I used the Buffalo Check stamp with Daffodil Delight ink to create the background. I stamped it several times using the Stamparatus. I then created layers using Daffodil Delight, Pool Party and Whisper White. I stamped the images with Tuxedo Black Memento ink on to a piece of Whisper White cardstock and colored the legs, hands and skirt with Stampin' Blends markers using Light Pool Party for the background of the skirt, Light Granny Apple Green for the leaves and various colors for the flowers themselves. I then cropped the image with one of the rectangles from the Stitched Rectangle Framelits Dies. I wanted a colored band behind the Daffodil Delight layer and since I did not have any Pool Party ribbon I created a band by cutting a piece of Pool Party cardstock the dimensions I wanted and then embossing the piece with the Subtle Embossing Folder. I have used cardstock bands many times in the past but now that we have the Subtle Embossing Folder the band has a slight ribbon texture. Thank you for stopping by today. I hope you'll hop along to the next stop on the blog hop, Shawn de Olivieira at Shawn Stamps. There's lots of inspiration to be found in this group - and you don't want to miss it! Here is a list of the supplies I used. Click to see the product in the online store. Here is the Hand Delivered stamp set. Look at all the possibilities! You can receive it free with a $150 order. Leave your thoughts below! Thank you!! Welcome to InKing Royalty's January Blog Hop! This year's Blog Hop themes are inspired by a single word - and this month our projects are centered around LOVE. You're certain to see some amazing ideas for Valentine's Day in the hop, but there are other ways to honor love in the lineup, too. What fun! We are excited to share our creations with you today! After you read my post, I hope you'll hop over to the next person on the list at the base of this post. When I first saw the So Happy Together stamp set in the new Sale-a-bration (SAB) catalog I immediately decided that, while there were some cute things about the set, I was definitely not interested in getting it! (Please don't judge me!) There were plenty of other great things in the SAB catalog which, by the way, are all available as a free gift with an order of $50 or more. Then I saw this great New Year's card posted by my upline Brian King and I thought maybe I need it after all! Here is my card. 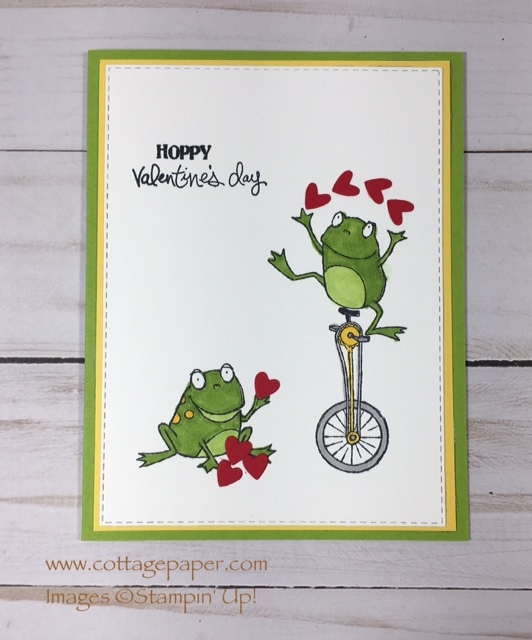 As I was looking for ideas for Valentine cards to make with my monthly card class when my eyes caught a glimpse of the juggling frog on the unicycle in the So Hoppy Together set. It occurred to me that he could be juggling hearts! I had also planned to use the group of hearts in the Be Mine Stitched Framelits Dies on another card and had all the punch out hearts sitting on my table. 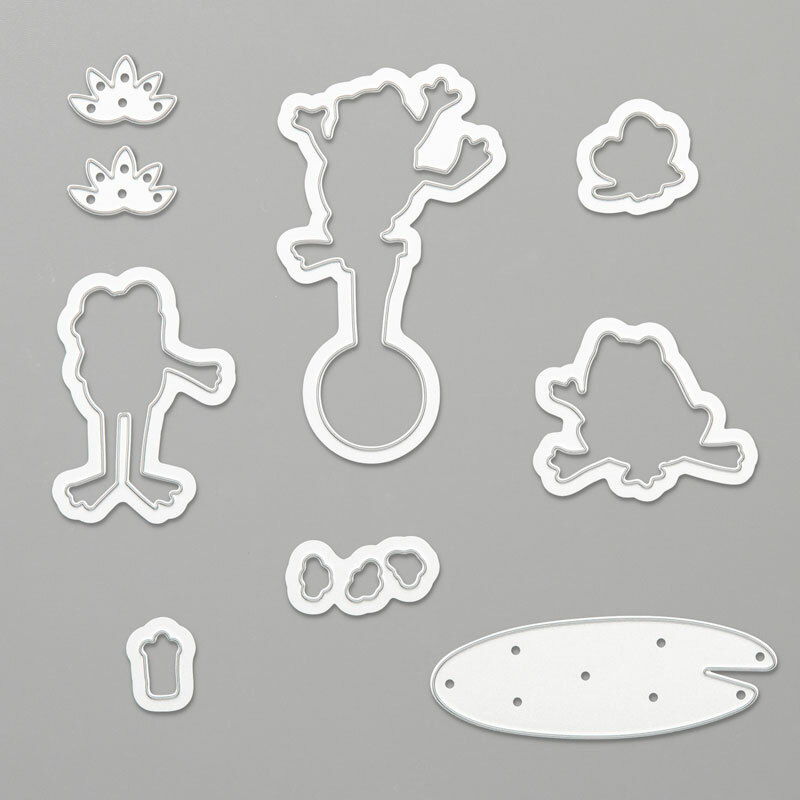 I used the tiniest ones for the juggler and some of the other small ones for the sitting frog. (I had to cut out 2 pieces of cardstock with the die in order to get enough tiny hearts.) You also could use tiny hearts from other Framelits sets and punches. I stamped everything with Tuxedo Black Memento ink and used Stampin Blends for coloring the images. For the frogs I used light and dark Granny Apple Green with dark Daffodil Delight for the "spots". On the unicycle I used more dark Daffodil Delight plus dark Smoky Slate and dark Basic Black. 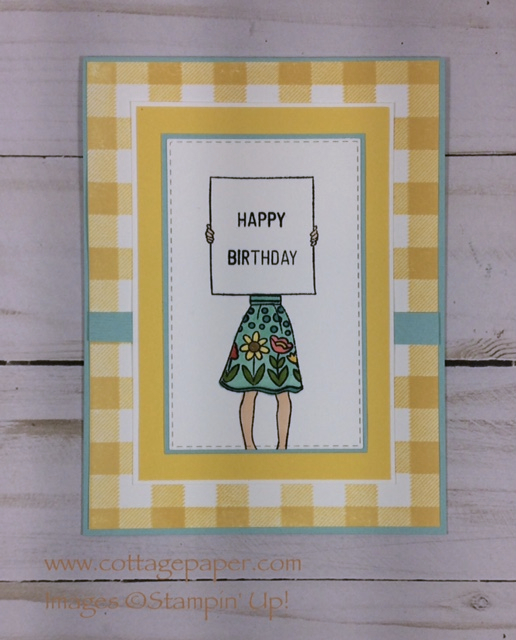 The card base is Granny Apple Green cardstock with a layer of Daffodil Delight and then the Whisper White stamped layer which I cut with the 2nd largest rectangle die from the Rectangle Stitched Framelits Dies. I cheated a little on the sentiment. The set contains the sentiment "Hoppy for you". I found an old wood mount greeting set that had the sentiment "Happy Valentine's Day". I could have masked the unneeded parts of each stamp I took the quick and easy way out. I unmounted the wood mount sentiment and cut off "for you" and "Happy" from the two stamps to make the sentiment I needed. While the stamp I used to add the "Valentine's Day" is no longer available there are many current or retired sets that would have a sentiment that would work here. I think the first greeting cards that I ever made were ones that I helped my kids make to sent to their grandparents. That was a long time ago - probably before many of you were born. Our options for supplies were extremely limited! I think the only place to buy anything for crafting was our local Kmart or Woolco (a discount owned by Woolworth that is now out of business). Mainly our supplies consisted of construction paper and that was only in primary colors, no Bermuda Bay or Granny Apple Green! I remember wishing I could buy dollies, especially heart shaped ones. I knew they existed because I had seen pictures of them but I had never seen any for sale. Things have sure changed and it is wonderful to have the all fantastic products that Stampin Up! now offers to crafters no matter where you live. Hope you make some Valentine's Day cards this year either by yourself or with others. Happy Valentine's Day!! Thank you for stopping by today. I hope you'll hop along to the next stop on the blog hop, Pam Morris at Tap Tap Stamp. There's lots of inspiration to be found in this group - and you don't want to miss it! Here is a list of the supplies I used. Click to see the product. 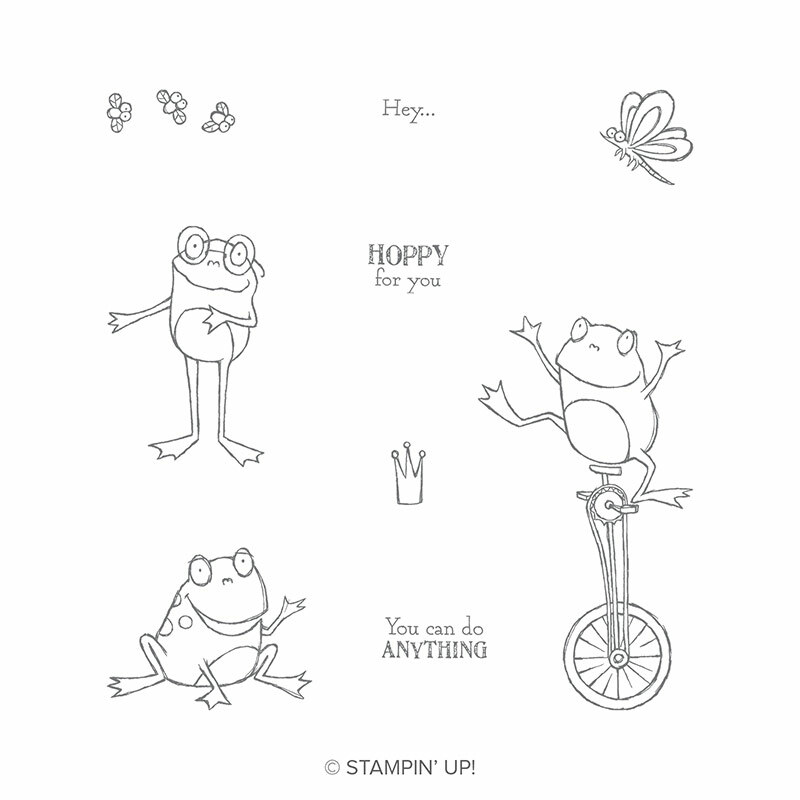 Here is a look at the So Hoppy Together Stamp Set. Addendum 2/1/2019: Stampin Up! has just announced that Hop Around Framelits dies that coordinate with the So Hoppy Together set will be available to order from March 1, 2019 to March 31, 2019!! The die set will sell for $28. 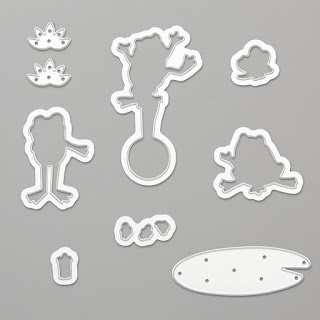 If you do not have the stamp set and would like to have it and the dies, you can purchase the dies and add one or two more things to your order to bring the total to $50 or more and you can get the stamp set for free! I ♥ comments and would love to hear what you think!! Leave your thoughts below! Thanks!